Temptation. We’ve all experienced it and will experience it again. The devil likes to make us think that what is a temptation for our self does not tempt anyone else, causing us to feel isolated and to lose hope, thus making it easier to commit sin. But that is inherently NOT TRUE! Jesus was tempted and never sinned. 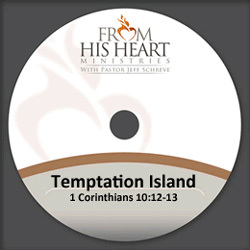 In this inspiring message from Pastor Jeff Schreve called TEMPTATION ISLAND, he shows us the truth about temptation and how God can help you deal with it. This message is part of the 11-message series WHY ON EARTH AM I HERE.